Happy Friday! We are just popping in to let you know about another opportunity to WIN! Lindsey is a fellow believer and inspiration as a wife, mom, and business owner. She makes beautiful hand-stitched goodies and somehow finds time to keep up with a very encouraging blog. You will love her! Hey there! I would spend the gift card on the praying with your child book. I just started homeschooling last week. My husband and I pulled our daughter out of public school at the end of the year last year and we are still trying to get a good routine down. I loooooove this idea! 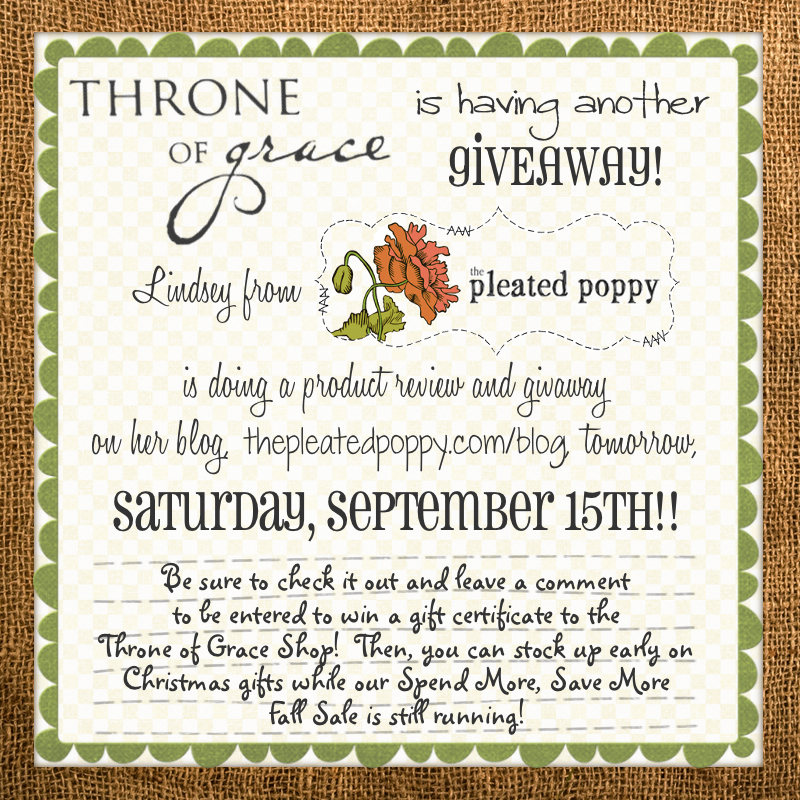 I’m here from the Pleated Poppy site…I’ve enjoyed looking through your items. What a great way to plant scripture in us and use it to pray over our loved ones! My son leaves tomorrow afternoon for Marine Boot Camp. There’s a lot of mixed emotions in our home right now. From pride to sadness to anxiousness…and a whole lot in between!! Your “How to pray for your Marine” cards are great! Thanks so much for stopping by to say hello! It is such a blessing to hear that our products have been an encouragement to you. I’ve been thinking about you and your son’s “deployment” to boot camp. How is it going so far? We would love the opportunity to pray for him (and you!) if you would like. If so, send me an email or leave a message here to let me know how we can be praying and we will add him to our Prayer & Praise Monday list for next week! May the Lord hold you and your son steady in His care! I’m loving your products. We are home schoolers and would definitely use these at the beginning of our day when we sing hymns and read scripture. Adorable and durable! Blessings to you! I really love the book God’s Word for a Child’s Heart. I think it is so important to link why we make certain choices to the Word. That is why I also love the book with verses on on the Train Up Your Child’s Heart. I like the topical nature of these and how they link to character traits. These are so special! I think having the Word at our fingertips so that we can plant it into our hearts it critical. As a mom, I am sometimes too busy to dug up a verse relating to a topic going on right then. This would be a great and quick go-to resource! I also read on the blog that these are a great idea for new Christians/evangelizing. I love the idea of getting these for one of my new friends who is a new Christian and has expressed that he is often overwhelmed with getting into the Word. Thank you so much for these great products! Thanks, you all, for stopping by to visit us at Throne of Grace! We are glad you found us from The Pleated Poppy and hope you will stick around to be a part of the community here. We are blessed by your interest in our ministry and thank you for all the sweet words of encouragement! Hi, visiting from the pleated poppy. Love your stuff. I feel like I often get stuck in the same prayers for my children and loved the “How to Pray for your Child” cards. What a great encouragement and reminder of prayers we can pray for our children from God’s word.